Instead of Santa & Gifts. It can be easy for kids (and even adults) to get wrapped up in the materialism of Christmas. “I want this … and this … and that” are familiar refrains to parents everywhere. So what about this year focusing on getting your Sunday School students to better grasp the true meaning of Christmas? Well, it’s not with what I’m about to show you … and parents will certainly appreciate you focusing on a more “humble Christmas” instead of one that involves the commercialism that has enveloped the holiday. Particularly when you compare our lives now with the humble way Jesus entered the world. In fact, one way to drive home the message of a humble Christmas might be to create Christmas projects, like a Nativity, using inexpensive household objects. You could let your imagination run wild – for example, maybe a shoe box would make a great stable, old papers sent through the paper shredder could make great hay, an old bottle cap bent with a pair of pliers could be a manger. Making humble Christmas projects could be a great way to catch the spirit of humility and help kids see that fun needn’t cost a fortune and that there are more important things to consider on Christmas than just what presents you received. Here’s something else to keep in mind – younger children especially have no problem imagining precisely what you tell them. If you say these two cotton balls are an angel and the two paper clips are going to be her wings, younger children will be happy to help in construction. Older kids will then capture the message and even build on it! When you are finished, your kids can enjoy the same feeling of humility that warmly wrapped itself around Joseph and Mary and the cattle and the shepherds and even the angels. If so, we have created a “Christmas Lesson Pack” that contains all the lessons, games, crafts, snacks, science projects, songs and skits you need to help your students find the real joy in Christmas no matter what else is going on. Discover how to use a balloon and a plastic spoon to teach children about the true meaning of Christmas. Easy-to-learn songs that reinforce the reason for the season. Plus, a caroling book with all the classics! Our worksheet is great to use as a pre-class warm up activity or as a backup if you need to fill 5-15 minutes in a hurry. Let the kids play! Our games are fun & message-driven. Our snacks recipes tie into the lessons, so kids can learn something while they help prepare and eat. Our “Bible Science Experiments” are always a hit! Help kids understand more abstract faith concepts with visible science projects! Our skits can be practiced and performed in the same hour- they are easy, memorable, and always FUN! 5 simple holiday ideas that bring comfort and joy! A fun project that helps kids understand the importance of allowing God’s love to fill us, like it filled Jesus throughout his birth, life and death on the cross! The absolute best gift your students could ever get on Christmas! Why humble beginnings can often make for great endings! How to make sure your kids never leave Jesus out of his own birthday party just because the toys and food are too enticing! Simple games that are extremely fun to play and that teach kids all the elements of the Christmas story! How to get kids to understand the true comfort and joy that comes from the fact that God came to walk among men in the humblest of ways! The truth behind 1 Peter 5:5-6 which begins “God resists the proud but draws near to the humble…”! How to get kids focused on the importance of giving gifts instead of just receiving them! How to make a homemade Christmas tree that will also teach kids the value of recycling! How to help kids understand that even though they can’t see God, he is always with them! How to keep your kids from getting so wrapped up in the Christmas commotion that they lose sight of what it is really about! How to help students remember the good things in life and be grateful for what they have! This handout is the perfect "reminder" to distribute to parents during this busy season. Feel free to print out as many parent copies as you need for the Moms & Dads at your church. 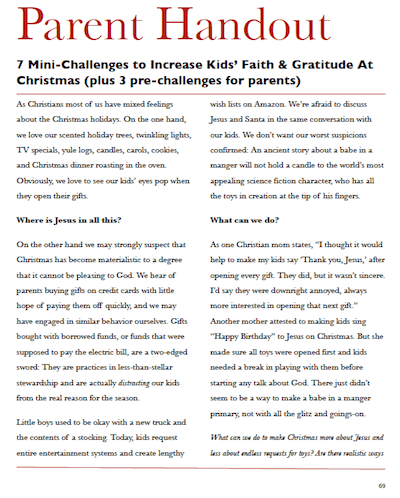 These challenges will help parents and their children shift the focus to Jesus this holiday season. The challenges will also deepen children’s love for the real reason for the season and will help create extra-fond memories that can last for years! Order Now & Get All of This for Just $7! That’s right, order now and you can get all of the above for just $7. The material in this Lesson Pack is easily worth three times that amount and it all will help your students understand the true joy Christmas. 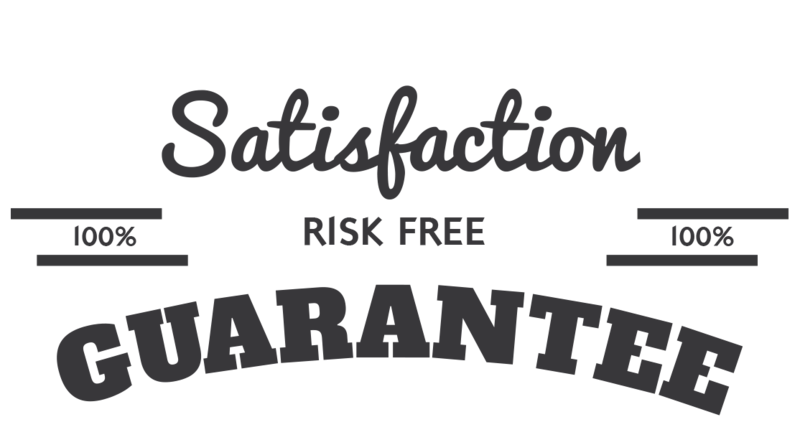 We are so sure that you will love the Christmas Lesson Pack that we are offering an unconditional 100% money-back guarantee. As Christians, most of us have mixed feelings about the Christmas holidays. On the one hand, we love our scented holiday trees, twinkling lights, TV specials, yule logs, candles, carols, cookies, and Christmas dinner roasting in the oven. Obviously, we love to see kids’ eyes pop when they open their gifts as well. On the other hand, we may strongly suspect that Christmas has become materialistic to a degree that it cannot be pleasing to God. Get the Christmas Lesson Pack today and help your students understand that Christmas should be about Jesus and less about endless requests for toys. To get your copy at the special low price of $7, click on the order now button below. YES, I want in! I want access to the "50 Christmas Printables". Please give me INSTANT access right now! 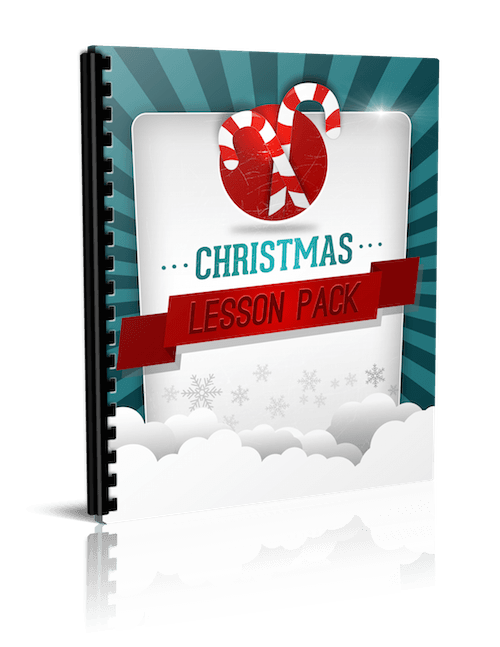 A Perfect Complement to your Christmas Lesson Pack! 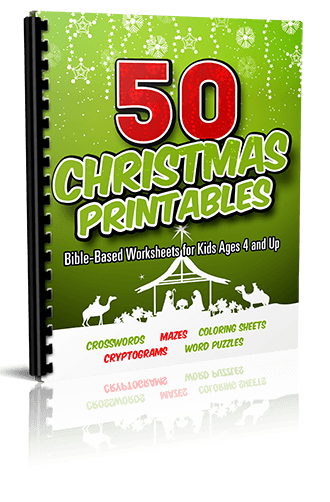 Our 50 Christmas Printables ($7) teach kids what Christmas is truly about while they color, draw, and solve puzzles. Included: Mazes, Crosswords, Word Searches, Coloring Sheets, & Cryptograms. Ages 4-12. Print as many as you need! No ThanksI Just Want the Lesson Pack Today.